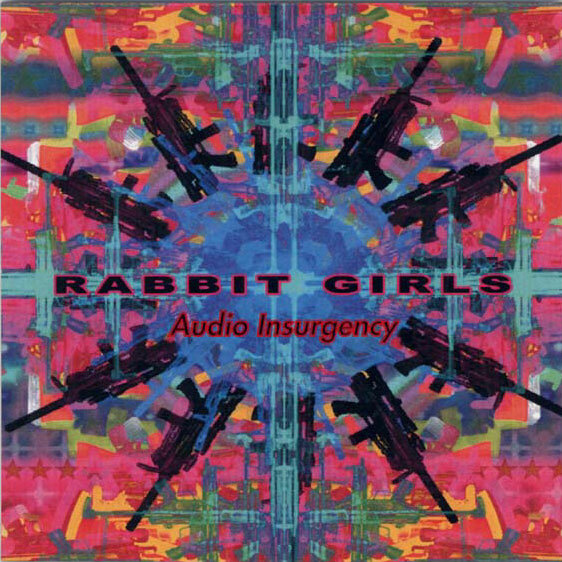 “Audio Insurgency,” a Roil Noise Records release from Rabbit Girls, is noise the way I like it– unrelenting, too complex to completely grasp in any single listening session, brimming with unexpected detail, and probably the results of hours and hours of intense editing work. Take my favorite track, “Snatcher,” for instance. Starting with a jet-engine blast of fluid screech, low rumble, and a high tone that borders on nauseous; careful listeners can appreciate all sorts of great detail– there’s a ‘gasping’ quality to the rush of sound in the background, almost like a series of processed screams. Or check the low whistling noise, or the siren tone. At times, I hear something like distorted guitar tremolo noises. Regardless, attempting to ‘grab’ it all just results in dropping something else from my attention. It’s that old story of the greedy dog, on a double minidisc set. And here’s something I’m just going to throw out there– “Snatcher” reminds me a LOT of Jimi Hendrix’s “…and the Gods Made Love,” but done as a noise piece. How strange is that? Let me quit fawning over this track. It’s not like it’s the only good one or anything! In fact, there is a remarkably high level of quality across both discs. “Musical Abatement” seems to mix more ‘live’ recordings with studio work, or at the very least, allows a sense of space that noise recordings often lack. And seriously, aren’t you jealous you didn’t think of that track title first? I know I am. The challenge for listeners is keeping up. As I’ve mentioned, the recording quality of these two minidiscs is excellent. The minis come in a simple ziplock-style bag that seems to be the hallmark of many Roil Noise Records releases, along with full-color artwork. This entry was posted on June 15, 2007 at 3:21 pm and is filed under experimental, experimental music, music review, noise. You can follow any responses to this entry through the RSS 2.0 feed. You can leave a response, or trackback from your own site. Yeah! Audio Insurgency had a great effect on me. It was actually the cheif inspiration for Instability.